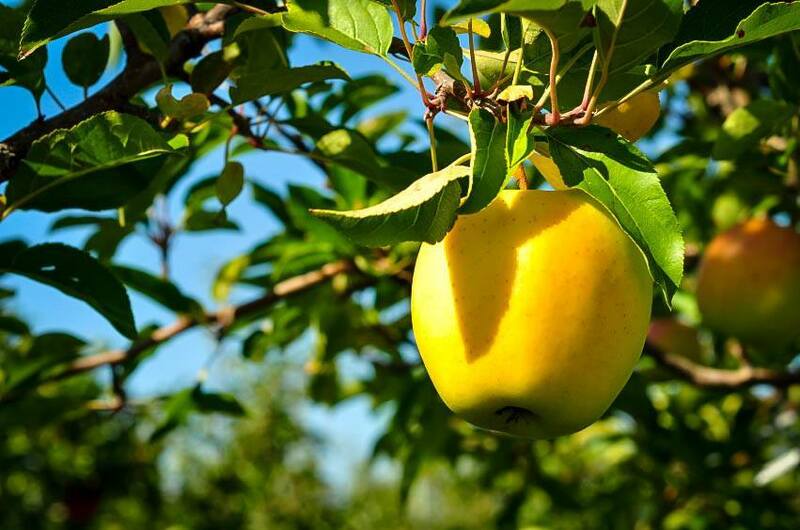 The Yellow Delicious Apple Tree (also known as the Golden Delicious) is one of the most popular varieties of apples, because of the delicious flavor of its fruit. The tree is easy to grow, bears well and will still give a good crop even if grown alone. It is hardy in zone 4, so it can be grown across most of the country and it will grow in most kinds of soil. The pale-pink flowers will add beauty to your spring garden too. Yellow Delicious is a good storing apple, so your bumper crop will keep well and give you delicious fruit for many months of the year. Apples are an easy fruit tree to grow and are a great choice when you want to start making your garden productive as well as beautiful. 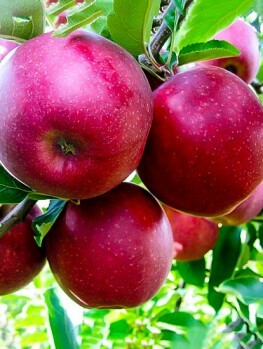 Apples are one of the best fruits to grow at home. 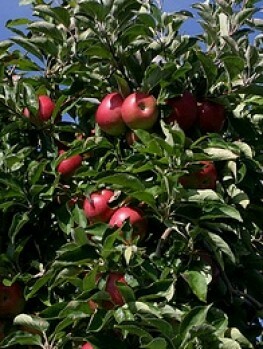 Unlike some other fruit trees they are hardy even in the coldest regions of the United States and the fruit stores well. 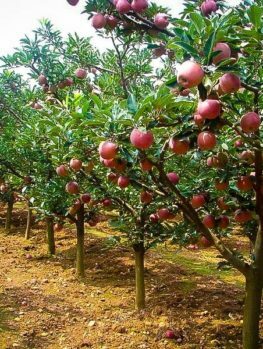 They give a large harvest and, since it can be stored for months, nothing is wasted and you will enjoy eating your own apples fresh, or cooking them in many different recipes, for most of the winter. It makes sense to choose a well-known apple that even your children will love to eat. Not only is the Yellow Delicious Apple great to eat, it is one of the best storing apples around. If you are not always impressed by this variety when it comes from the store, you are in for a surprise when you grow your own, because a tree-ripened Yellow Delicious is one of the best-tasting apples you can find. Store-bought apples are picked green for transport and they have not had time to develop their full flavor, so the quality cannot be compared. Not only is Yellow Delicious a great eating apple, the tree is hardy, not fussy about soil and it has good pest and disease resistance. This is especially important if you want to avoid chemical treatments on your food plants and have the healthiest crops possible. 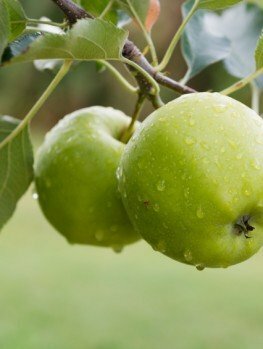 As well, Yellow Delicious will produce a good crop even when grown alone, so if you have a smaller garden you only need one apple tree, which means you can now grow your own fruit in a limited space. 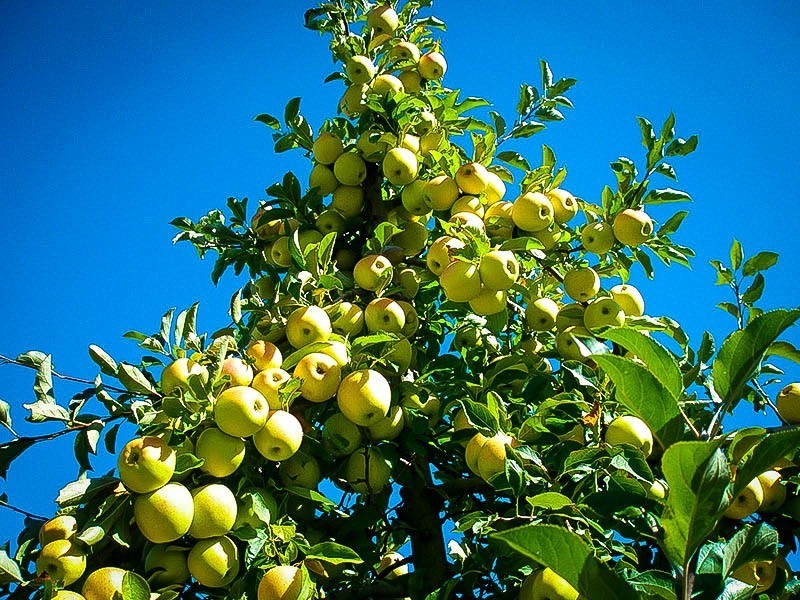 The Yellow Delicious Apple Tree is also known as Golden Delicious and despite its name it is not closely related to the Red Delicious Apple Tree. The Yellow Delicious is an all-American heirloom variety that was discovered in the 1890’s in West Virginia. It went on to become one of the most famous apples in the world, yet it is still widely grown today because of the high quality and flavor of its fruit. 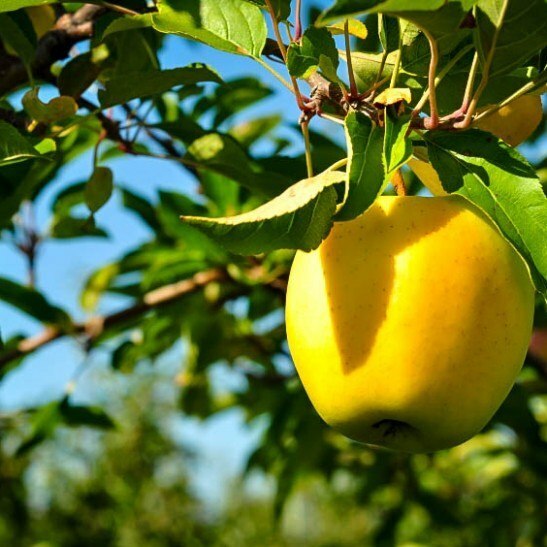 The Yellow Delicious Apple grows into a tree around 15 feet high and about 10 feet across. In spring the branches are covered with pale-pink blossoms making a beautiful sight and this is one of the most attractive apple varieties when in bloom. It rivals many of the crab-apples for spring beauty. As the flower petals fall the fruits begin to develop and by fall your tree will be covered with good-sized green apples. By late-September you will see a golden color developing on the fruit and that is the signal to start harvesting. 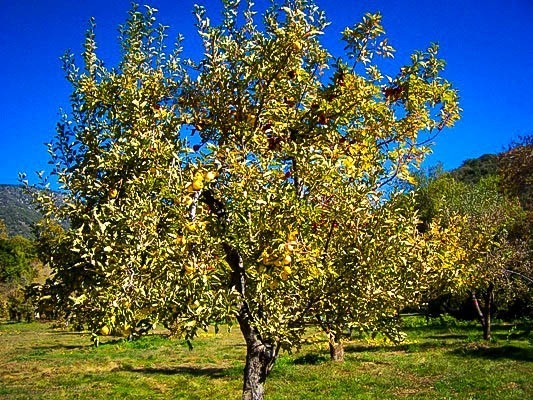 The Yellow Delicious Apple Tree will produce a good crop of apples all by itself, but for the largest possible crop it can be grown with a different variety so that both trees pollinate each other. 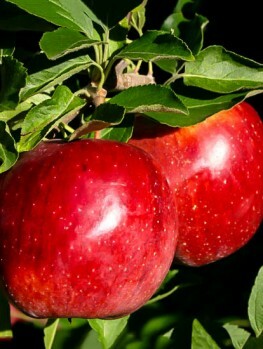 The Red Delicious Apple Tree and the Jonathan Apple Tree both make ideal partners and will also give you a greater variety of fruit from you garden. You will be amazed at how sweet and juicy, yet still refreshing, this variety is when tree-ripened. The flesh is a crisp white and this apple is not just great to eat, it cooks well too and is delicious in salads, pies and dessert. 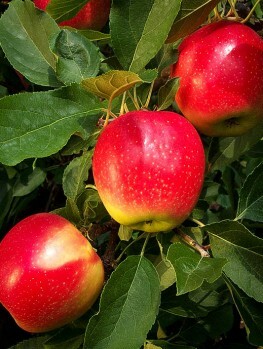 A mature tree can give you 15 to 20 bushels of apples, so be ready to store your harvest in a cool place close to 320F. Prevent your stored apples from shriveling by keeping the air around them humid – Styrofoam boxes make great containers for apple storage. To plant your tree, choose a sunny location in soil that is rich but well-drained. If your soil is heavy dig plenty of coarse organic material, like garden compost, manure or rotted leaves into the planting area. Dig the hole three times the width of the pot and plant your tree so that the ‘kink’ in the stem, which is where it is joined to its roots, is about 3 inches above the final soil surface. Place the tree in the hole and using a sharp knife cut down the root ball about one inch deep from top to bottom. This will encourage the roots to spread outwards. Replace most of the soil and firm it down around the roots. Fill the hole with water and once all that water has drained away replace the rest of the soil in the hole. Mulch around the tree with more rich organic material, but keep it away from the trunk and only put it over the root zone. After planting, make sure to water your new tree once a week during the first growing season and then when the soil is dry. Always water well out from the trunk under the spread of the branches. Do not allow weeds or grass to grow under the tree until it is mature. Some pruning is needed for the best results and you should keep a central stem going up. Allow several branches to radiate out from the trunk and shorten new growth by about one-third to encourage flowering and fruiting. If you have a heavy crop of baby apples, remove some so that each cluster has only one fruit. You will have a smaller number of apples but they will be much larger and more useful. 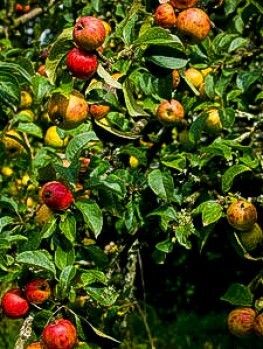 The Yellow Delicious Apple Tree is a special, heirloom variety that can only be grown from trees of the correct variety. 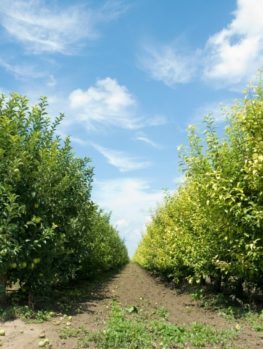 Our trees are produced in the proper fashion, by taking stem pieces from those original trees and grafting them onto special roots that control the size of your tree. Beware of cheaper seedling trees or un-named varieties that will not be the true Yellow Delicious and will only be a disappointment to you. Our Yellow Delicious Apple Trees are true to the original form. We are constantly renewing our stock so that our customers get only the freshest and healthiest plants, so supplies of this very popular tree may be limited. To avoid disappointment order now.